No poverty, no hunger. Climate change mitigation and adaptation, access to clean water and affordable and modern energy for everyone. 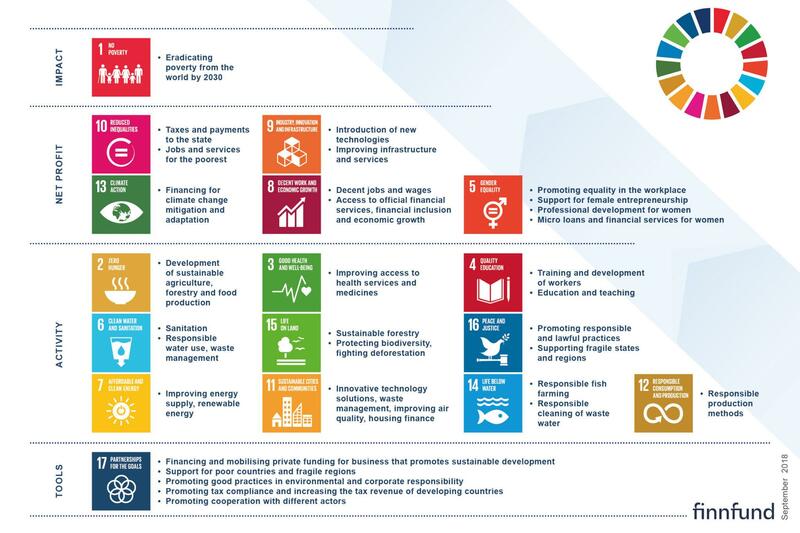 These are examples of the sustainable development goals that cannot be achieved without the contribution of companies. Why do companies matter? During the preparation of Agenda 2030 and the sustainable development goals, it became clear that they cannot be met by official develop­ment aid only. It is estimated that developing countries will need up to USD 4,000 billion in additional invest­ments to achieve these goals. A significant share of this would need to come from the private sec­tor. It is also clear that companies alone cannot re­solve all development challenges – as is hardly ever the case with a single tool. Different types of actions and actors are needed. However, responsible companies can create stability and prosperity, and develop and provide tools e.g. to make it easier to adapt to dry seasons caused by climate change. In practice, it can include strengthening food security, for example through development of agriculture and food supply, better water systems and cleantech, which can help people both in rural areas and cities to prepare themselves for extreme weather caused by climate change. What is Finnfund’s role as a development financier? Finnfund’s role is to promote the economic and social development of developing countries by financing profitable and responsible businesses. Responsible companies play an important role in solving major global challenges such as poverty, inequality and climate change. Finnfund does not provide development aid, but invests in economically viable and responsible businesses that produce development impacts. Finnfund provides long-term financing for projects that otherwise might not be implemented – as a development financier Finnfund is ready to take the risk that commercial financiers are often not ready for. In addition, Finnfund’s funding often leverages additional commercial financing. At the same time, Finnfund aims to strengthen the development impacts of these investments and improve the companies’ responsibility towards people, the environment and society. In practice, this means, for example, that Finnfund assesses development impacts before making the investment decision and ties its pay­ments to completed improvements in corporate responsibility. Investment has three criteria: economic profitability, responsibility and development impacts. Each investment decision is assessed on the basis of these criteria before the investment decision and the implementation is assessed and monitored over the entire life cycle of the investment. people directly – of which 16,200 were women. micro and SME loans – 40% clients were women. for climate change mitigation or adaptation. Sustainable development and prosperity for all and everywhere in the world? In 2015, the UN Member States agreed to achieve the 2030 Agenda for Sustainable Development and the Sustainable Development Goals (SDGs) by 2030. From the very beginning it has been clear that companies need to be involved; it is estimated that developing countries will require fresh investments worth up to USD 4,000 billion. Finnfund is one of the Finnish government’s instruments for mobilising such funding. It is also clear that companies alone cannot resolve all development challenges; different types of actions and actors are needed. This picture shows examples of how Finnfund’s investments promote the achievement of the 17 sustainable development goals. Responsibility is at the core of Finnfund’s work. Interested to know more? Read our latest reports and publications.